Do these mop handles fit the mop heads - 23281? Yes the mop handles fit these mop heads. are these for the brush heads too as nothing comes up for colour coded brush head handles other than these that just refer to the mops? Yes these handles fit our brush heads and our mops heads. Our Mop Handles have been designed to offer an economical alternative to more expensive models. 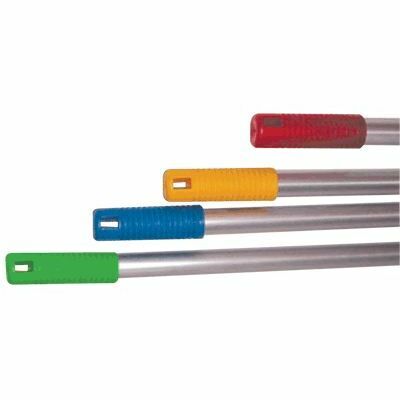 Manufactured from a lightweight but durable aluminium, these rigid come in a range of colours that coordinate with the matching mop heads and also fit in with your cross contamination coding regime. Easy to install, each one featured a screw fitting that winds down into your chosen head with a small hanging hole on the handle for easy storage. The entire handle can be sanitised and disinfected easily with it's smooth design while fitting in well alongside any existing items or tools. These mop handles are designed to pair seamlessly with our Cotton Twine Mop Head. Why not consider adding either our Gompels Lemon Floor Cleaner or the Flash Professional Delicate Surface Cleaner to your basket as well?